Tomorrow is the beginning of the Microsoft 12 Days of Deals promotion and they are starting off with an impressive offer. Starting tomorrow at Microsoft Store retail locations you can pick up the Toshiba Encore Mini 7″ Windows tablet for an impressive $49.00. It even comes with a 16GB MicroSD card for additional storage. The deal is labeled as a “door buster” so it is likely a limited number of these that will be offered at this price and it will only be at their retail locations. For those who don’t have a store nearby or would simply prefer to avoid malls (Clinton raises his hand), you can get the tablet for $79 all day.The Encore Mini is a pretty potent little tablet running Windows 8.1 with Bing. Here are the highlights of the specs for it. 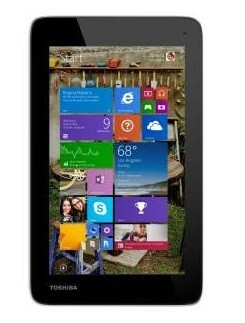 As part of the promotion, Microsoft is including a 16GB MicroSD card with the tablet for additional storage. That is normally a $19.99 value itself. Also, as with other tablets, you get a year of Office 365 Personal free with the Encore Mini, another $69 value. Microsoft has been selling the Toshiba Encore Mini for $99 on their website after dropping it from $119 last month. Now at $49 or $79, the savings are a bit better. For more information or to order online, you can check the Encore Mini out on the Microsoft website.